Can you believe that before this year, Portland, Oregon was lacking a Comic-Con? From the Emerald City to New York to, of course, San Diego, Comic-Cons have been cropping up the world over. Originally a niched convention for dedicated fans, Comic-Cons have become events of national appeal and acclaim; they’re an overall celebration of what it means to be a fan. In under two weeks — September 8 and 9 — Portland gets their own. Comic-Cons, traditionally, feature tables full of comic vendors where you can meet artists and presses (often with specials! 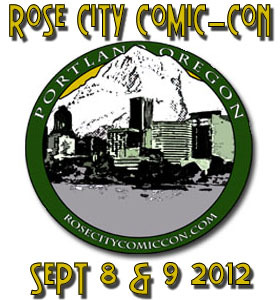 ), panels of industry greats, and incredible workshops, and the Rose City’s is no exception. We got a chance to speak with intrepid Rose City Comic-Con organizer Ron Brister about some of the geeky staples in his own backyard, comics in Portland, and taking on the incredible feat of organizing a festival while still having a day job. Describe the Portland comix scene and why you felt you needed to bring it a Comic-Con. Of course, there’s a wider scope of pop culture than just comics — as is the nature of the modern comic-con. Is there still an emphasis of comics themselves, or is this about a wider landscape? Rose City Comic-Con is a comic convention at heart. With that in mind we have focused our efforts on comic artist, writers, and vendors. However, comics these days have a massive crossover into other genres such as sci-fi and fantasy. Many of our guest are not only comic folks but they are also novelists, screen writers, musicians and actors. But I think the foundation for all those other creative mediums is comics. This is the Comic-Con’s first year — did you do any similar events before? Yes, this is the convention’s first year and I sometimes feel like I was crazy for starting this thing. We’ve not run a convention like this in the past. Myself, I work for a software company and I have done events related to that industry but nothing in the realm of Pop Culture before this. What are some of the biggest challenges you’ve encountered setting up a huge, first-year convention like this? We’ve had a few challenges along the way. The first one was having to move our original date. Being a first year convention we looked at the calendar over and over trying to figure out just the right time to have it. We landed on a date in October of this year originally and soon after we announced our dates and started doing press, APE (Comic-Con’s Alternative Press Expo) and NYCC (New York Comic-Con) announced the same weekend. Both of those shows are huge and would have detracted from us being able to attract talent and vendors to a start-up. So, we moved our date up a month. Second, getting awareness up was a challenge. We needed to get people talking about us, paying attention to us. The best way to do that is to attract some talent to the event. However, when you’re in your first year, it’s hard to get folks to sign on early when you really have no metrics to prove the value of the convention. Needless to say, we relentlessly went after the talent that lived in the area and slowly but surely we got people to sign on and start talking to their fans about us. Lastly, just the overall logistics of such an event. It is a massive undertaking in the first year with lots of moving parts. We’ve learned a lot along the way including what not to do in year two. My main recommendation for anyone do something like this: Make action item lists and budget forecasts. This is a lifesaver. In an earlier conversation, we discussed the inter-generational appeal of the guests. Did you seek out guests along a wider, geeky timeline, or did things just fall into place that way? Yeah, we didn’t really plan on the geek timeline but it just kinda worked out. We had originally been working with a talent firm to try to book a guest or two. However, the costs were pretty high and for the money we could afford to spend on talent, there just wasn’t anyone we felt like we had to have. Then we got a call from someone who knew Richard Hatch (of “Battlestar Galactica”) and that person put us in direct contact. Richard was absolutely wonderful about the whole thing. He understood it was our first year and he really worked with us to ensure that we could bring him to town. Next, another gentlemen contacted us and indicated that he knew both Kathy Coleman (“Land of the Lost”) and Noah Hathaway (“Neverending Story”), much like with Richard we got in contact with both of them and worked out the details. So, all-in-all, it was just fate that made the geeky timeline and looking at it now, its pretty cool. There is a special guest for every generation attending the convention. I’m pretty excited for a couple of them. First, we are showing a special advance screening of a feature film – “Lloyd the Conqueror.” I think that will be a lot of fun, I’ve seen the film and its really fun. It will be fun to see if with a bunch of folks and enjoy their reactions. Second, I’m pretty excited about a drawing session with Randy Emberlin. Randy is known for “Spiderman” and teaches locally in after school programs how to create characters both in concept and design. I think that panel will be a ton of fun for all ages. And lastly, I can’t wait for the “Ask Axe Cop” panel. “Axe Cop” is a great comic for kids and is illustrated by Ethan Nicolle and written by his little brother Malachai. This will be wildly entertaining! Who should come to Comic-Con? Besides everybody, of course. We hope people from all walks of life will want to join us. We truly have something for everyone. Amazing art will be for sale, music to enjoy, games to be played, movies to be seen, and of course…comics to be viewed, purchased, and read. At the end of the day, we want this to be a fun family event that will get kids interested in different artistic mediums. Do you have any advice for someone who wants to put on a similar event? Think long and hard about the stress and effort involved. It is not for the faint of heart. Once you’ve talked yourself into it, surround yourself with people you can trust to do the work you will need to offload. Also, there will be critics along the way, those who think you are crazy, in over your head – ignore them. Do the things you conceive and you will fail at nothing. Don’t do them, you fail without even trying. Want to go and experience Rose City Comic-Con for yourself? We’re giving away three pairs of passes! Comment below with the answer to the following question: if you considered yourself a fan of only one thing, what would it be? Get an extra entry for tweeting to @RoseCityCC with a link to this post. You can even use this handy button! Winners will be contacted via info provided to Disqus or via Twitter by 2 p.m. tomorrow. Tags: Alternative Press Expo, Axe Cop, Battlestar Galactica, Comic-Con, comics, conventions, Dark Horse Comics, Ethan Nicolle, event organizing, fantasy, festivals, film, Kathy Coleman, LARPing, Lloyd the Conqueror, Malachai Nicolle, Neverending Story, Noah Hathaway, NYCC, Oregon, Periscope, pop culture, portland, Randy Emberlin, Richard Hatch, Ron Brister, Rose City Comic Con, sci-fi, Spiderman.